"Acting is all about being able to think on your feet, improvise, and follow instructions"
She tries to keep a low profile but don't be fooled into thinking she is some pushover. She is a strong person who knows what she wants and has quietly made a mark for herself with her performance as the central character in the hit serial Heena on Sony Entertainment Television. Even her marriage to noted director and producer Farhad Samar was a quiet affair - in her home town of Chandigarh - in the company of near and dear ones. After securing a degree in arts, Singh took up her first job in a TV production House in Delhi and worked there for two months. Later she came to Mumbai to be here with her childhood friend and figure out her next move. And boy did she make the right ones. Just as a matter of a chance, she dropped her portfolio at production company Plus Channel. And she got selected to star in the long English soap "A Mouthful of Sky". Then came "Heena" and she has not looked back since. Working quietly but with grit and determination. Working the way she wants, and not joining the rat race like several other actresses of this day have. She is choosy and selective about her roles. Of the roles that you've been playing so far, which is your favourite role and why? I don't have any favourite role. I have enjoyed doing all of them, though I am quite fond of Rupal, the character in "Sea Hawks", and mainly because its nice to work with interesting people. When you have an interesting actor, a good actor, and a director who can get something new... get something creative out of you ... it motivates you. I enjoyed playing Madhulika in "A Mouthful of Sky", even though that was my first show ever. You're quite selective about roles. Yes, very selective. In fact, after I signed "Heena", for a year-and-a-half I did not take up anything. People thought I was mad! When you get the biggest show on air, everyone goes home happy signing left, right and centre, is what they told me. Were you waiting for a good role? I wasn't waiting for the right role; there were good roles which came my way. It's just that I wanted to be focused on one show at a time. 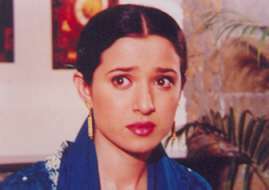 See, before "Heena" I did not do any lead role because I didn't want to get into it frivolously. I wanted to be sure that I was ready to take on this commitment because it is a commitment for at least a year. When I took a lead role in Heena, I wanted to do that a bit and see what I want to do next... beside also have time to myself; enjoy the first lead role and all that. Is it that you were trying to gauge yourself? No. I wasn't trying to gauge myself. For as a performer you only grow with the every extra bit of work you do. I was trying to be sure. Was this what I wanted to do for a very long time is what I asked myself. Was it acting or the role? Were you giving it a second thought? Not that I jumped into it. It came my way, but I wasn't sure how long I would enjoy doing it, especially on television. Did you do theatre before? No. Just amateur stuff when I was in school. Is it easy being an actress, was it easy for you to be one? It was easy for me. But you still have to be attentive, be careful and have to be interested. And keep learning. It is not that 'oh...I have a little bit of talent and think that I can get through it'. You have to keep working at it. How do you work on it? How do I work on it... the same like everybody else does. I just imagine. You think about the character, how you want to play it and lot of other things which come within the parameters of your craft. The script is generally not written in advance. We really don't have all the time to go deeply into it. You decide as to how you would want play it within the scene - to try and make it more interesting, you try and work along with your co-actor, director and that is how you work on it. When you play the character what goes on in your mind. I mean do you forget you are Simone while playing the character? In deliberation? Do I lose myself as a character? It's not a short-term thing that you become a character and lose yourself in it. Television is one week out of every month. You would be extremely schizophrenic if one week out of every month you became the character. So, no I don't think so. I never want to be pompous and say that. It would be extremely pretentious to say that. I am not going to say that. What are you thinking while facing the camera? Ghosh! I hope I am saying the lines right. Hope I am in the right place taking the light and being able to play the character as real as I can make it. With the light, camera... dialogues and all that in your mind how do you compose yourself? See that's what an actress's job is all about. If you are going to get thrown around and become nervous after all these years, then that would be very silly. It's your job, you've got to do it to the best of your abilities like any other job and be able to think on your feet, improvise, and follow instructions. How do you improve your acting skills? I really learnt on the job. Many people have come up to me asking if I was looking for training. They say they would like to help me and that it would enhance my performance. But, really speaking I learnt on the job. How was it when you just stepped into acting and what's it like now after five years? I've definitely come a long way. Like I said, I learnt while working. If in any way you think about what you're doing and don't do it by rote then you do improve. Your work becomes more detailed. What kind of role do you like? One that is well written. There is nothing you can do with a badly written character. I mean is there any particular kind of role you like? It doesn't have to be any particular kind. Why should you want to limit yourself! How do you prepare for tough scenes? Like I said. I try I remember all my lines. Is your shooting schedule back to back? I shoot for 'Heena' the first week of every month and in the third week I do 'Tum Pukar Lo'. In between I do one off things, an ad film or any one day shoot. What is it that you like? Ads or acting? I prefer acting. Ads. They are always fun. They make you look good. Money is good. It's a short 30 seconds thing. It takes 20 to 25 takes of the same line because they want it in a certain way. I enjoy doing ads but I enjoy acting better because it is more interesting. How do you select a script. What do you go for? A powerful story, a well written character and the people who are making it should be good people. That is more important to me because I would be working with them for at least a year. How long does it take you to learn a script? Well in TV you should be grateful if the script is there when you reach work in the morning. Sometimes, you will have just finished one scene when the script for another scene arrives. You cannot afford to be a prima donna. It is very silly when people say they take hours and hours to learn the script. Maybe for the first schedule you have to think about certain mannerisms. After a while, you fall into the character easily. TV is unfortunately really constrained by tight budgets. One has to live within these parameters and make sure everybody goes home with enough money to be happy. So everything has to be quick. How do you expand your repertoire? I try and work on subtle variations, understand what the situation is like, and then accordingly try to act it out as close to real as possible. How do you expand the spectrum of your acting abilities. I try to understand the character, their mannerisms. The protagonist in 'Heena' is subtle, subdued, while that in 'Tum Pukar Lo' is perky. She is a lively, bubbly sort. How often do you feel you could have done this shot in a better way? Do you work on your voice? As in voice training? No I don't. Which actor, actress do you like? What about them do you like? I like a few from old movies. Robert De Neiro, Dustin Hoffman and the list goes on. I like different things about different people. How are you as a person? I am very polite. Very reserved. It is so embarrassing to describe yourself. You should ask this to my sister, my husband. Travelling. When I was younger I used to go trekking, canoeing and things like that. I would like to do it again but have not been able to. I was supposed to go to the mountains in the North before I came to Mumbai, but then this job happened and every since it been continuously postponed. Which is your favourite place? Every new place that I go to is my favourite for a while. My latest new favourites are New York and Goa. What is it about them that you like? You love reading, what is that you like to read? I read everything, fiction, non-fiction... about people, how they live... the age that they lived in. Books are for me a great escape. It's a way of being in another place at another time. What matters to you the most? What makes you happy?